The Ethnography Museum is located on a hill donated by the General Directorate of Foundations to the Ministry of National Education. The architect Arif Hikmet (Koyunoğlu) is one of the most renowned architects of the early Republican period. The building has a rectangular plan with a single dome. The stone walls are faced with coarse sandstone, and the marble pediment has carved decoration. A special commission to collect and purchase artefacts was established in Istanbul, headed by Prof. Celal Esad (Arseven) in 1924 and then by Halil Ethem (Eldem), Director of Istanbul Museums, in 1925. 1,250 purchased artefacts were placed in the museum whose construction was completed in 1927. Hamit Zübeyr Koşay was appointed as the director. The equestrian bronze statue of Atatürk that stands in front of the Museum was made by the Italian sculptor B. Conanica at the request of the Ministry of National Education in 1927. 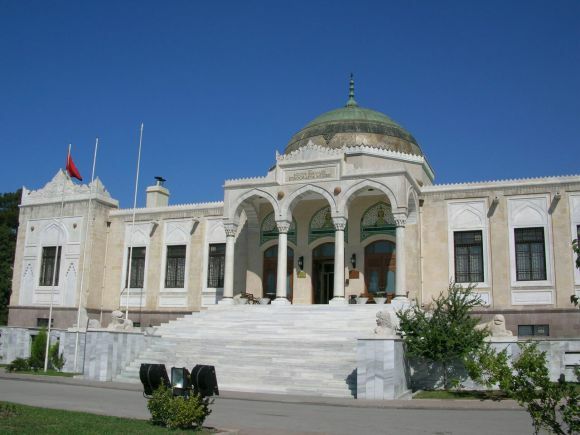 On 15 April 1928, Gazi Mustafa Kemal Pasha (Atatürk) visited the museum and on his request the museum was opened to public on 18 July 1930 on the occasion of the visit of Afghan King Amanullah Han. In November 1938 the inner courtyard was reserved as a temporary mausoleum for Atatürk until his body was transferred to his own mausoleum, the Anıtkabir, in 1953. This section is stil kept as a symbolic cenotaph in Atatürk’s memory. Between 1953 and 1956, renovations were carried out for the International Museums Week in 1956 when the museum was reopened to the public. The Ethnography Museum houses examples of Turkish art dating from the Seljuq period to modern times. To the right of the entrance are halls displaying items related to the Anatolian wedding ceremony and bridal dresses, Turkish embroidery, Turkish carpets, Anatolian coffee culture and the circumcision ceremony. To the left of the entrance are halls housing tile and glass artefacts, objects donated by Besim Atalay, Ottoman calligraphy and some of the finest wooden artefacts from the Seljuq and Emirate periods.